Summer arrived belatedly in northern California and high snowmelt runoff is attracting adrenaline junkies seeking to raft and kayak Sierra Nevada rivers. With its many large rivers, the west slope of the Sierra Nevada provides some of the best whitewater boating in the world, supporting a healthy recreation economy up and down the range. Whitewater boaters require a sweet spot of flows. If the water is too low, rocks make safe navigation difficult, and if the water is too high, the river’s power makes it too dangerous to run. Gradient also plays an important role in the range of flows that can be boated. Low gradient rivers tend to be runnable in a wide range of conditions; high gradient rivers, such as those occurring in gorges throughout the Sierra, typically have a narrow range. The specific conditions necessary for whitewater boating makes it a seasonable sport vulnerable to changes in hydrologic conditions. Given the economic value of whitewater recreation, particularly to many Sierra foothill communities, it is reasonable to ask whether climate change is going to have an impact on boating. Recent studies on the hydrology of the Sierra Nevada have shown that climate change scenarios will likely alter river flows (Young et. al. 2009), and that this may reduce hydropower production, alter riverine ecosystems, and threaten agricultural and urban water supply (Null et al. 2010). However, a recent modeling project on unregulated rivers in the Sierra Nevada indicates that the impact of climate warming on whitewater boating is surprisingly mixed (Ligare, et al. 2011). Under mild warming (+2° C or 3.6°F annually), changes in runoff are likely to increase the average number of boatable weeks per year. However, under extreme warming (+6° C or 10.6° F) there will be a significant decrease in the average boatable weeks per year across the Sierra Nevada. These results vary depending upon location and gradient of the run. Low elevation drainages, such as the Cosumnes and the Tule River Basins, are most likely to see reductions in boatable weeks in any warming scenario due to the small proportion of their watersheds that are covered with snow. With less snowmelt runoff, there would be fewer opportunities for finding the whitewater sweet spot. The same applies to some of the high elevation watersheds, such as the Kern. These larger watersheds have extensive low gradient rivers (Class II-III) in their lower portions. A reduction in snow volume and an earlier timing of snowmelt runoff reduces the number of boating days on these rivers. However, in the central Sierra Nevada, where narrow gorges make boating impossible during peak snowmelt, a reduction in peak snowmelt would create more weeks of accessibility for boaters. 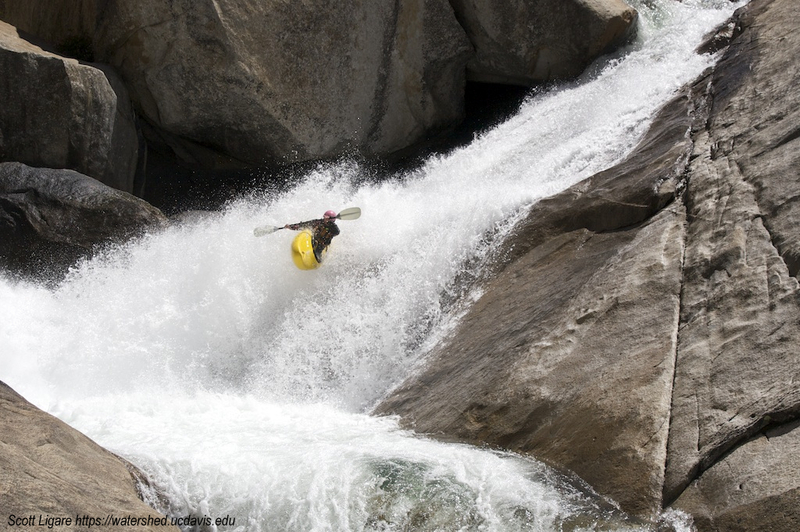 Historically difficult kayak runs that make up a large portion of the whitewater boating in the Sierra Nevada have flows that are too high to descend during the snowmelt peak. Later in the spring and summer when snowmelt recedes, flows drop to a boatable range—sometimes only for a short period of time before flows become too low. With mild climate warming scenarios, the snowmelt peak runoff is less and the decline to summer flows is more gradual, increasing the period of time that these gorges are boatable. With more extreme climate warming scenarios however, many rivers never get high enough in the spring to become boatable, reducing the overall average number of boatable weeks. Recreation is important for river management and is often a source of contention during Federal Energy Regulatory Commission relicensing of hydropower facilities. Relicensing negotiations have successfully included flows for whitewater recreation on regulated stretches of the North Fork Feather and South Fork American and are currently being negotiated on the Yuba-Bear/Drum Spaulding, and Upper American projects. If climate warming results in a decrease in whitewater recreation opportunities on unregulated rivers, whitewater boating on regulated rivers will become more important to manage successfully. Ligare, S. T., J. H. Viers, S.E. Null, D.E. Rheinheimer and J.F. Mount (2011), “Non-uniform changes to whitewater recreation in California’s Sierra Nevada from regional climate warming,” River Research and Applications, 27: n/a. doi: 10.1002/rra.1522. Null, S.E., J.H. Viers and J.F. Mount (2010), “Hydrologic response and watershed sensitivity to climate warming in California’s Sierra Nevada,” PLoS ONE 5(4).10.1371/journal.pone.0009932. Young, C., M. Escobar-Arias, M. Fernandes, B. Joyce, M. Kiparsky, J. Mount, V. Mehta, D. Purkey, J. Viers and D. Yates (2009), “Modeling the Hydrology of Climate Change in California’s Sierra Nevada for Subwatershed Scale Adaptation,” Journal of American Water Resources Association 45(6): 15. This entry was posted in California Water and tagged boating, climate change, hydrology, hydropower, Sierra Nevada, UC Davis Center for Watershed Sciences, water management, whitewater recreation. Bookmark the permalink.